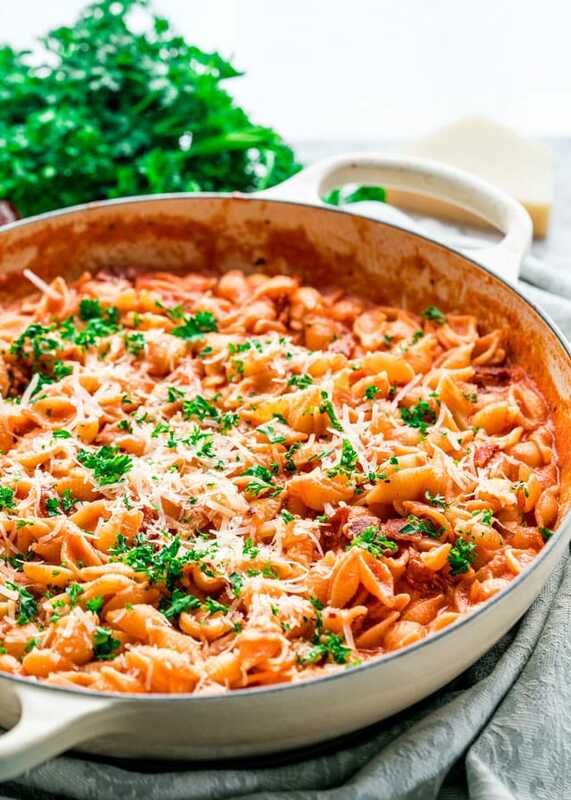 This easy Pasta alla Vodka recipe is perfect for a quick weeknight dinner with an easy and creamy tomato and vodka sauce, topped with bacon and Parmesan cheese and ready in only 30 minutes! 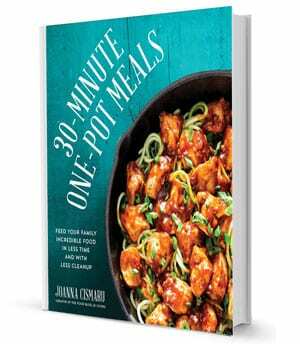 Today I have an easy 30 minute pasta alla vodka dish! You might want to ask me if this pasta is family friendly; I’d say it definitely is safe for kids, because the vodka cooks off so most of the alcohol will evaporate. Whatever alcohol is left in the dish is minuscule! This is a recipe that everyone will love. For this recipe you will need olive oil, an onion, garlic, a touch of each nutmeg and red pepper flakes, tomato puree, and half and half (10%) cream. I used mini shells for my pasta alla vodka recipe and also topped everything with bacon and parmesan cheese. What’s the point of making such an awesome dinner without going all out, right? As per the name, there is indeed vodka used in this sauce! There is no alcohol flavor left in the sauce after is cooks down. You might be asking yourself right now, well then what’s the point of using the vodka? As we know, vodka is nearly colorless, nearly odourless, and nearly flavorless. The vodka is used to release the acids and flavor of the tomatoes in the sauce and enhance the sweetness of the cream. I thought the mini shells were perfect for this recipe! I just love how they cradle little pools of sauce. Talk about flavor right there! This sauce will go with any shape of pasta, really. Try it out with penne, rotini, or long shapes like spaghetti, fettuccine, or linguini. 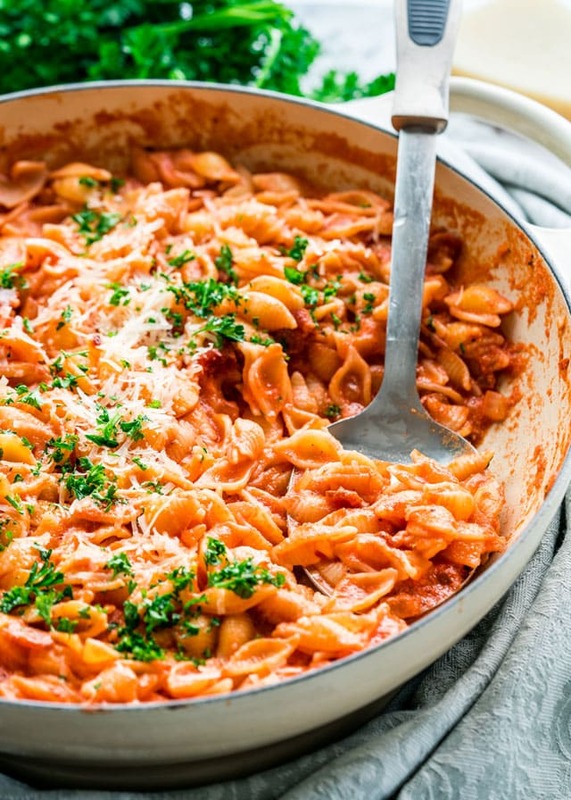 Since now we know the vodka acts as a flavor enhancer in this pasta alla vodka recipe instead of really adding any flavor of its own, you can settle for a cheaper bottle. You don’t need to go out and buy some quadruple-distilled premium vodka in a gigantic glass bottle! I mean, if that’s what you happen to have lying around at home then go for it. Start out by cooking your pasta. Reserve some of the pasta water before straining. After straining it, give it a rinse with some cold water so that it doesn’t turn into a big sticky lump of noodles. Now, you can begin heating your olive oil in a large braiser or skillet. Add the onion to your pan and let it cook for a few minutes, until translucent, before adding the garlic. Let everything toast up for 30 seconds – one minute. Deglaze the pan with the vodka and keep everything moving for a few minutes until the vodka has cooked down. Now you can season with the nutmeg, red pepper flakes, salt, and pepper. Pour in the tomato puree and cream, give everything a good stir, and let it come to a boil. It’s time to add the pasta, bacon, and parmesan cheese. I like to leave a bit of cheese and bacon on the side to sprinkle over top the whole dish. Doesn’t it look awesome? As I always say, we eat with our eyes first! If the sauce is too thick, add some of the reserved pasta water until you have a nice saucy consistency. Garnish with parsley, and enjoy! I know some of you may ask what to use instead of vodka. 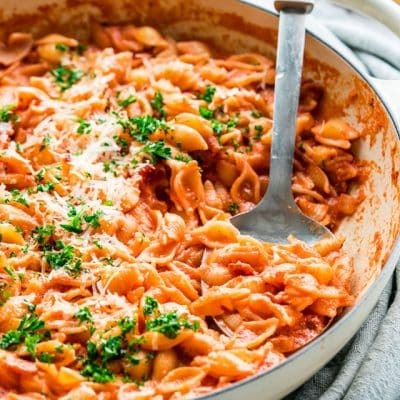 Considering this recipe is pasta alla vodka, I would say that vodka is the number one ingredient here! If you don’t want to use vodka, move on and choose another recipe from my many other pasta dishes here on the blog. I think this sauce is one that needs to be tried and I’m sure you’ll love it. 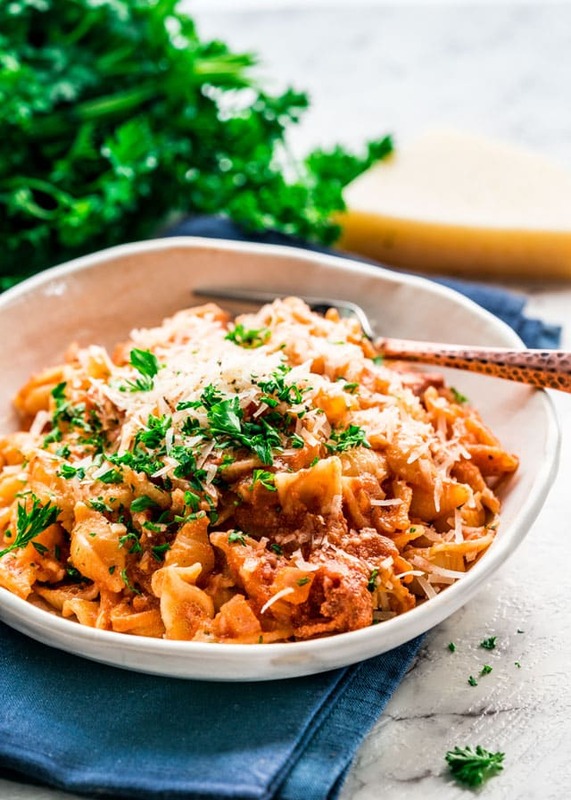 This Pasta alla Vodka is perfect for a quick weeknight dinner with an easy and creamy tomato and vodka sauce, topped with bacon and Parmesan cheese! Cook pasta: Cook the pasta according to package instructions. Drain in a colander and rinse it under cold water to stop it from cooking any further. Reserve some of the pasta water, just in case we need it to thin out the sauce. Make vodka sauce: Heat the olive oil in a large skillet over medium-high heat. Add the onion and cook for 3 to 5 minutes until it softens and becomes translucent. Add the garlic and cook for another 30 seconds until it becomes aromatic. Add the vodka, stir and cook for a couple minutes until the almost all of the vodka has cooked down. Stir in the nutmeg, red pepper flakes, salt and pepper. Add the tomato puree to the skillet, then stir in the half and half or heavy cream. Bring to a boil. Stir in pasta: Stir in the cooked pasta, bacon and the Parmesan cheese. If the sauce is too thick and the pasta has soaked up all the sauce, add some of the reserved pasta water. Garnish and serve: Garnish with parsley and serve. Half and half is equal parts whole milk and light cream and it usually averages 10 to 12% fat, which is usually less than light cream. Leftovers: Store leftovers in an airtight container for 3 to 5 days in the refrigerator. You can also freeze this in an airtight container for up to 2 months. 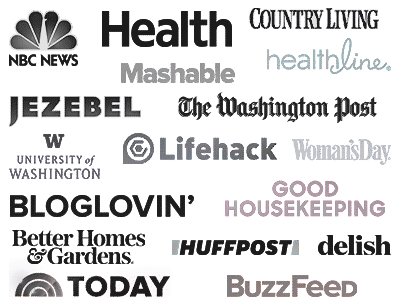 Can I use fat free half and half? Yes, that should be fine! Fantastic, we all loved our dinner!